- Webmail includes spam protection, here you can determine what happens to the Emails you are being sent that contain are suspected spam. - Now we're in the 'Preferences' area, as indicated in the far left column on the image below, in the next column select the top menu option of 'Spam Settings'. 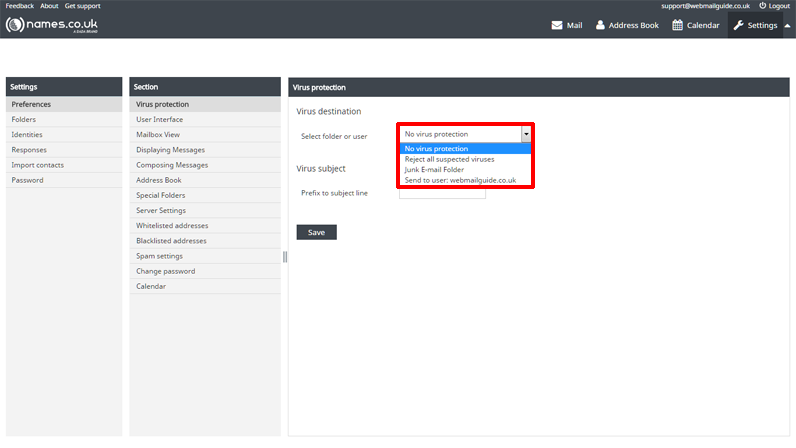 - In the 'Spam destination' section of this page, you'll notice a drop-down menu adjacent to the 'Select folder or user', select this and you'' see a few different options. The first option is 'No Spam Protection', this will allow all Emails to arrive in your inbox, regardless of the Email containing a suspected spam, 'Reject All Suspected Spam' will result in all Emails containing a suspected spam being denied access to your mailbox altogether, in selecting 'Junk Email Folder' Emails containing a suspected spam will be denied access to your webmail inbox but will be redirected to your Junk folder, so you can determine for yourself if they are safe to open, then lastly the 'Send to user' option, so if you would prefer that another mailbox you have setup on the domain receives these Emails instead, select the substitute mailbox from this drop-down list. - In the 'Prefix to subject line' text box, you can enter a word of your choosing to appear before any Emails webmail suspects is spam. This option is only of use to you if you have selected a spam destination of anything other than 'Reject all suspected spam'. 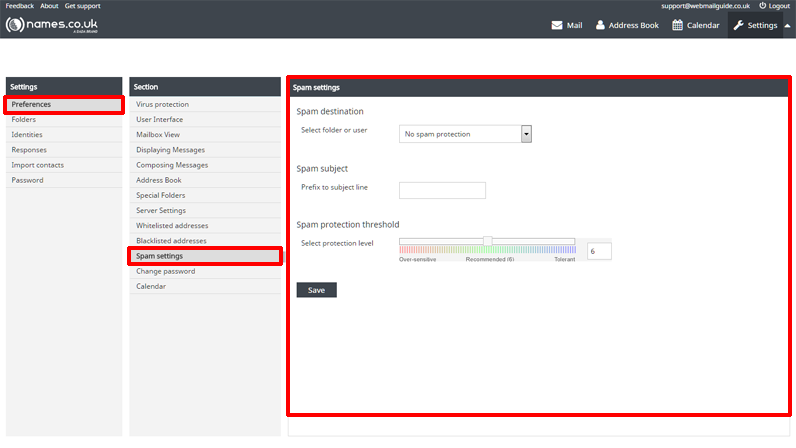 - The 'Spam protection threshold' section includes a spam protection level slider, if you currently allow suspected spam to arrive to your inbox, to your junk folder or an alternative mailbox to that of your own and you feel that there is too much spam, you should move the slider left. It's recommended that each time you revise these settings that you do so by increments of one, to opt for increments of more than one on the slider might mean that Emails from common contacts with an over average spam score assigned to their Email content, Email address or their domain name may no longer be able to reach you and their Emails may fall into the spam trap. 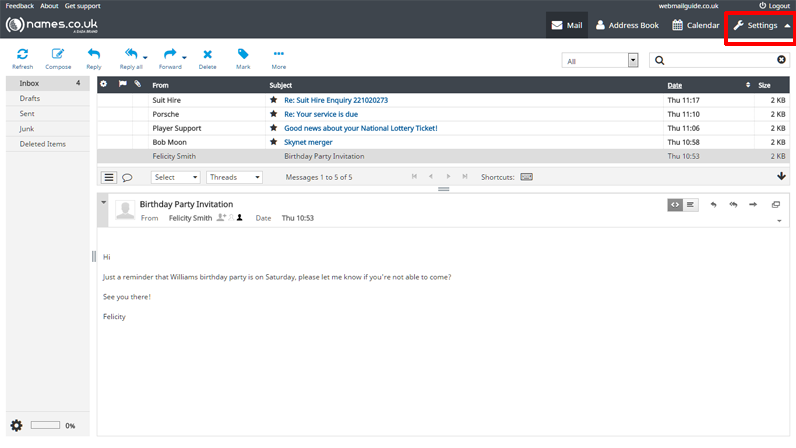 If you feel that you don't receive spam and that you're missing Emails from legitimate contacts of yours, you can slide the level to the right making the mailbox more tolerant of spam, spam level 6 is usually sufficient.